If the stock market were a transatlantic flight, the ride just went from uncomfortably bumpy to white-knuckle turbulence. 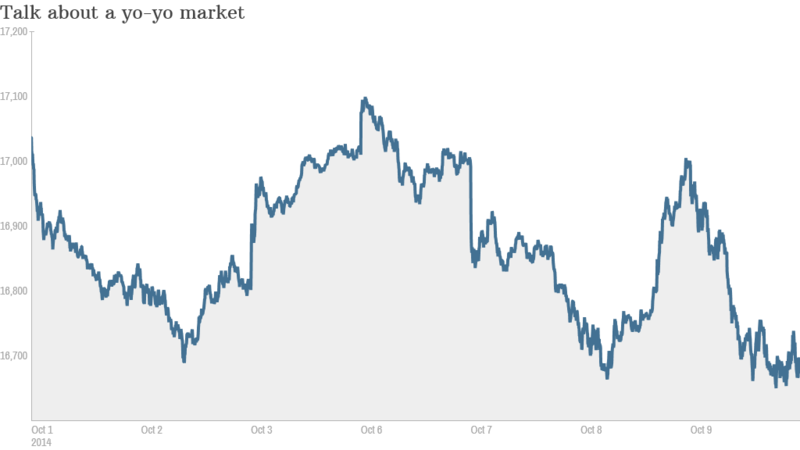 The Dow plunged 335 points on Thursday, its worst day of the entire year on a point basis. October is shaping up to be a scary month for anyone with money in the market, but for now investors are just trying to catch their breath. Already this month, there have been five days with major market moves where the Dow has swung up or down more than 200 points. Wednesday -- mere hours ago -- was actually the best day of the year so far for stocks. What's behind all of this volatility? Market moves aren't always logical, but it's clear that investors are growing increasingly nervous about the fate of the European and Chinese economies. And they don't know how that will change the Federal Reserve's plans to remove the easy-money punchbowl. The violent swings in the market confused professionals and retail investors alike. "Everyone who thought they were in the clear yesterday walked in today and got punched in the face," said Michael Block, chief strategist at Rhino Trading Partners. "Just when you think have it figured out, you don't. This is a very tough market." Jitters about Europe's slumping economy were amplified by new numbers revealing German exports shrank dramatically in August. Investors are now losing sleep over the threat that Germany -- Europe's economic engine -- could slip into a recession. CNNMoney's Fear & Greed Index is now flashing "extreme fear," compared with just run-of-the-mill "fear" a month ago. The wild market moves are also reflected in the VIX volatility index, which spiked 21% on Thursday. "The only thing I'm currently bullish on is volatility," said Stocktwits user shogunofharlem78 wrote. Related: Are stocks a trick or treat? Investors run to bonds: Investors are reacting to this by piling into safe-haven bonds, driving the yield on the 10-year Treasury below 2.3% for the first time in since June 2013. The point drop on the Dow was its worst of 2014, surpassing the 326 point decline on February 3. However, on a percentage basis today's 1.97% decline was not quite as extreme as that winter slide. That's little consolation to investors, who have watched the Dow retreat 4% from the all-time highs it set just last month. Both the S&P 500 and Nasdaq shed over 2% on Thursday, while the riskier Russell 2000 that includes smaller and mid-sized companies experienced a 2.5% tumble. "Once this market picks a direction, there are very few players who get in the way. It tends to just feed on itself," said Art Hogan, chief market strategist at Wunderlich Securities. The worst hit equities: Energy stocks were the biggest losers, plunging about 3.7% as a sector. Stocks like Chesapeake Energy (CHK), Anadarko Petroleum (APC) and Halliburton (HAL) suffered even bigger losses. Small-cap energy stocks really got creamed. The Russell 2000 Energy index plummeted 6%, leaving it down 22% over just the past month. The energy industry was slammed by sinking crude oil price, which fell as low as $85.60 per barrel -- levels unseen since late 2012. All 10 sectors of the S&P 500 lost at least 1% on Thursday, although more defensive groups like consumer stapes and utilities felt a bit less pain. Stocks spiked on Wednesday as the latest Fed meeting minutes suggested slowing global growth and a stronger dollar could prevent the central bank from lifting interest rates. Traders bet that would be good for stocks, which have been boosted by the Fed's emergency actions. "Last time I recall this kind of price action across all markets was 07-09," Stocktwits user 6killer wrote.